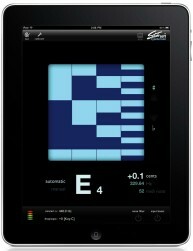 Peterson Strobe Tuners popular StroboSoft tuning application for the iPad® offers the unmatched accuracy of a mechanical strobe tuner for the highest degree of precision available in a software tuning application. Tune your electrics, acoustics, brass and woodwind instruments quickly and easily with 1/10th cent strobe precision. Peterson Tuners has offered tuning solutions for over 60 years and is the only company specializing in hardware, software, and mobile app tuning products for all levels of musicians. • Exclusive strobe display allows you to achieve an unmatched level of accuracy. • Note/Octave window displays the correct note and octave for the note being tuned. • Cents display allows you to see how far out of tune your note is in cent values. • Glowing flat/sharp indicators assist when tuning a note very far from the target position and it is difficult to gauge which direction the strobe is moving. • Noise filter: Use the noise filter when utilizing an external mic or clip-on tuning device to help reduce the effect of extraneous environmental noise during tuning. • Input boost: The input boost will raise all input frequencies by +24dB. • Calibration mode: iStroboSoft can be calibrated to an external source guaranteeing 1/10th cent accuracy. • Drop/Capo mode: iStroboSoft will auto-transpose notes up or down to one full octave. • Full screen mode permits the strobe display to be maximized on screen to allow better viewing from a distance. • Adjustable Concert A: Change the Concert A reference of the tuner to accommodate tuning to a fixed instrument, such as a piano, or tune instruments that do not utilize the typical Western A440 reference. iPod touch 2nd and 3rd generation users will require an external microphone similar to a headset mic used with the iPhone. iPod touch 4th generation users can utilize the built-in mic on their device. iPhone users can use the built-in mic for tuning. • Larger strobe display – Tune from across the room with ease due to the larger display. • Manual note select – Select notes to ‘target’ when tuning to avoid unwanted harmonics or partials from the display. • Display of Hz and MIDI note, in addition to cents option – View Hertz or MIDI note numbers for any note/octave combination. Cents readout is also included. • VGA output – Send the output of iStroboSoft to a projector. Excellent for classroom use or studios. • Optimized layout to utilize larger iPad display – All features are located on the main screen so users do not need to dig through layered menus.